The Fort Lauderdale Beach crime victim compensation attorneys at the Wolfson Law Firm can help you pursue the compensation you deserve from any responsible person or commercial business following a criminal incident. Call us at 305-285-1115 for your free consultation to determine whether you qualify for damages recovery. In the past, Fort Lauderdale Beach has been famous as the favorite spring break spot for college students. However, the city authorities were not happy with that reputation and in 1980’s decided to make a change. 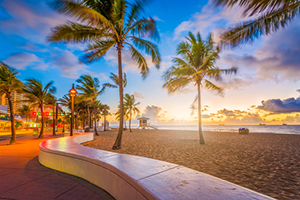 The redevelopment activities that followed in the following 15 years made Fort Lauderdale Beach a cultural, business and leisure center. Most importantly, what was once a spring break mecca, nowadays is a family resort center. If you have been injured in another type of crime, you may still be eligible for compensation. That is why it is so important for you to speak with the best Fort Lauderdale personal injury attorney you can locate. You deserve answers to determine if you are entitled to compensation. If you or your loved ones have sustained injuries as crime victims in Fort Lauderdale Beach, you may be entitled to damages recovery. You can seek compensation in three ways. One of them leads to the criminal offender. He can be held liable for paying you for damages once he is proven guilty and convicted. However, they rarely pay. Most often they don’t have enough money to pay for all the medical bills, and sometimes, they even don’t get caught by the police. That’s why, in most cases, it’s better if you don’t rely on this option and turn to others instead. You may be entitled to claim damages recovery if the crime has occurred at premises of a commercial business. Getting injured due to criminal activity at a gas station, motel, hotel, affordable housing complex, bar, nightclubs or shopping centers means that the person or company controlling these premises may be liable. They owe you, as a visitor or guest, a duty of reasonable care, meaning they need to take the reasonably necessary preventative measures to prevent crimes there. When they breach this duty because of negligence it can lead to criminal actions. If you’ve been injured in such a scenario, you may be able to claim damages against the person or corporation controlling the premises. Finally, you can opt for compensation by the Florida Bureau for Victim Compensation. If you can prove that your injuries have been sustained due to criminal actions in Florida, you may be entitled to recovery of some of your economic losses. The Fort Lauderdale Beach crime victim lawyers at the Wolfson Law Firm have helped injury victims in Florida since 1963. We are standing by to help you too. Just call us at 305-285-1115 for your free consultations. We won’t ask for fees unless we recover for you.